Each and every day, men and women in our area put their lives before others in the line of duty. Make your reservations now to join us as we recognize courageous men and women who serve as Corsicana & Navarro County law enforcement, fire, & EMS teams. All first responders eat free as we take the opportunity to recognize these individuals in appreciation for the hard work and sacrifice they provide in order to keep our community safe. We invite you to join us as we shake hands with our heroes! Breakfast will be served 6:30 a.m- 8:00 a.m.
For more information, call the Chamber at 903-874-4731. 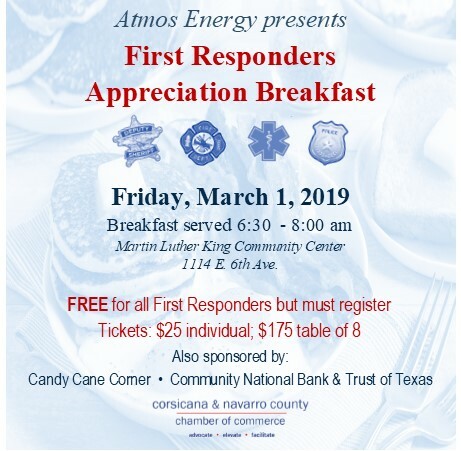 Free breakfast for all first responders.